There are a wide range of kids safety products in the market. The On-Guard Kid's Personal Safety Watch is a cool digital watch with 110 decibel emergency alarm & SOS signal that can be easily activated by children in an emergency. It has fun accessories for kids to personalize their watches, a Child Identification System, parental controls and a reminder alarm. The S-911 Personal Locator is a portable GPS tracking device which can be used as an emergency cellular phone with speed dialing for two-way voice communication. It can silently call any emergency number in the world for immediate assistance. The emergency silent call feature also provides a digitized voice message which can report the time, date, speed, heading, and location of a person in distress. The S-911's main goal is to help missing children, reduce kidnapping, and provide help for critical situations where immediate assistance is a must. It is also suitable for teens, adults and even asset tracking. S-911 Personal Locator features a silent panic call with preloaded digital voice; a rechargeable Li-Ion battery; USB data port for configuration and GPS NMEA output; individual Geo-Fence capability with in/out reporting; a built-in data logger to record time stamp, speed, position, heading, and event state; a G-Sensor to report an impact, accident, or bad driving; remote over-the-air configuration via GSM; real-time dynamic reporting based on time interval or distance travelled and built-in overspeed alerting and mileage accumulator. Complete Child ID & Records Kit. The Complete Child ID & Records Kit contains critical information cards for you, babysitters, doctors, grandparents, and any other caregivers for your children. Extremely helpful in case of emergency. Fingerprint, personal information, physical attributes and emergency contact cards are included. Child I.D. & Records Kit has a complete instruction guide and a magnetized mounting device for attaching to an easily reachable area. 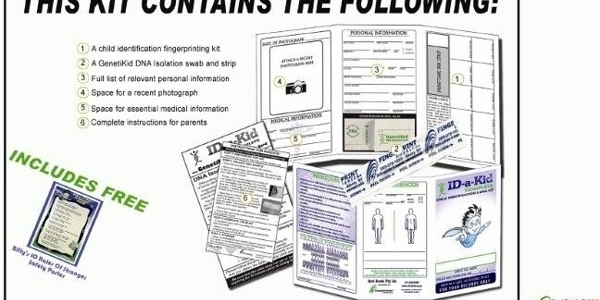 Kit Includes: 2x Photo identification cards, 1x Personal record card, 1x Physical record card, 1x Fingerprint record card, 1x Babysitter information card and medical release, 1x Child ID instruction guide, 1x Fingerprint ink strip, 4x Laminating sheets, 1x Magnetic strip for mounting. Missing Children SA ID Profile Kit, created by Missing Children SA, is intended to act as a tool for parents to store children's information and to help police in their investigations. We are not suggesting that your child will be one of the thousands of children each year who are reported abducted, missing or lost. However, in the event the MCSA Child ID Profile Kit is needed you'll have everything you need to help the South African Police Service and the Missing Children SA Task Team to get on-task as soon as possible. The purpose of the Child ID Profile Kit is to prevent unnecessary delays by preparing parents for such use by storing and managing their child's vital information so that is available if and when required. The Child ID Profile Kit is invaluable tool that may mean the safe return of your child. The kit comes with DNA bag, fingerprint pad and extra panels for filling in your child's vital information. You also have the choice to register your child's details with SACMED for quick access to the information for the necessary authorities and organisations to assist you in finding your child. The Ow-Wee Kid's First Aid Kit is ideal for a backpack, purse or diaper bag and was developed with kids' minor emergencies in mind. It contains: 4x Alcohol cleansing pads 3x 1-1/2"x1-1/2" Patch plastic bandages, 2x Antiseptic cleansing wipes (sting free), 6x 3/4"x3" Adhesive plastic bandages, 10x 3/8"x1-1/2" Adhesive junior plastic bandages, 1x Insect sting relief pad, 1x Antibiotic ointment pack, 1x First aid guide, 1x Carry anywhere case. The Boo Boo Buddy - Cold Pack brings relief for bumps and bruises - Stop tears fast! Kids Cold Packs are more comfortable than traditional ice packs. They are reusable, nontoxic, flexible even when frozen and hygienic. They can be used to numb pain quickly and naturally and last for 30 minutes. They are also hypo-allergenic and meet US Safety Testing Standards. To date the Dolphin Aquasonic Pool Alarm system is the most simple and effective. Developed to help prevent accidental drowning. The Dolphin Aquasonic pool alarm consists of only two components: a transmitter and receiver. To install, simply unpack, turn on the receiver unit and place it in the swimming pool, or body of water that needs protection. Place the waistband, wristband or collar on the child, adult or animal, and you have instant protection from drowning and peace of mind. As soon as the band makes contact with the water, the alarm sounds, warning of the unsafe condition and preventing a possible tragic accident. The receiver is placed in the pool or pond and the protected non swimmer wears a waist band or wrist band that houses an ultrasonic transmitter. Pool SOS alarm is a fully-integrated and portable swimming pool alarm system. It provides an additional safety measure for pools and Jacuzzis. It floats on the water's surface and makes a Loud Warning sound if someone accidently falls in the pool. Kid Tagz are award-winning child ID shoe tags that identify a child or relay important information in the event of an emergency such as a child's separation from his or her parents, medical emergencies or allergic reactions. Kid Tagz child ID tags are designed to fit securely on most types of children's shoes and are waterproof, durable and lightweight. Parents write vital information such as a cell phone number or medical alert directly on the inside of the child ID tag and snap it on their child's shoelaces, Velcro or sandal strap. Kindersafe Wristbands are a more permanent solution and are re-usable. These Velcro wrist-bands are waterproof, durable, fully adjustable and can be used from age 2 years. Details are written on an insert inside the wristband and they come in pink and blue. Tots ID Wristbands are re-usable and are made of a soft plastic. They are suitable for toddlers from age 1 to 7 years old. The contact details are written on the inside of the band. Tyvek Single Use Wristbands. There are five designs of bands, each pack contains a mixture. They are durable, water proof and attractive. Children love to wear them. Contact details such as teacher or parent number and important medical information can be written on the inside. 5 different designs to choose from. Waterproof and tear proof. Sticky closure for single use only. Ideal for school outings or holiday trips. Supplied in a pack of 30 (mixed designs). When Completing this Kit, have fun detailing safety issues. 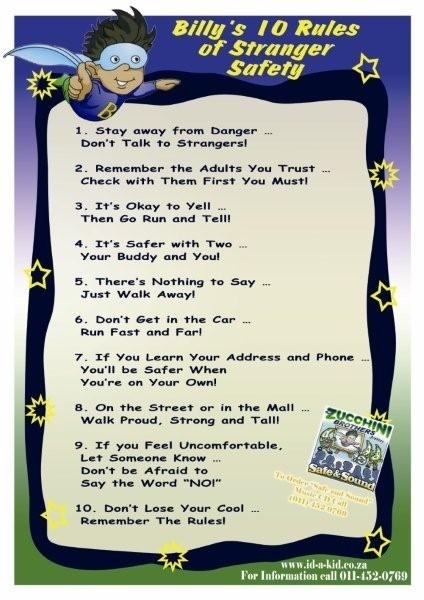 The parent and child safety awareness education that accrues from the completion of this kit is very beneficial. The kit is manual as we have designed our ID-a-Kid system to be completed at school or home with only a little assistance from technology (photo). Are you one of the people who believe that the authorities will only act on a missing person report after a 24 or 48 Hour period. Read and know the system. Our link with this wonderful organisation assists in making South Africans better armed in times of any type of crisis. For example from ambulance/ tow truck assistance to legal advice to locksmith emergencies etc. All these benefits at a minimal fee from R50.00 per month per family. Our link with SACMEC – South African Centre for Missing and Exploited Children allows us to offer ID-a-Kid Complete users the added option of registering their children with SACMEC – Access www.missingkids.co.za or complete the form enclosed and follow the instructions.